Let Netwind Learning Center provide you with the Oracle certification training for OCA and OCP for your career in Oracle's 10G, 11G or 11i platforms. For whatever path you choose, you should take every opportunity to gain training and hands on skills with the Oracle products and technology for the path that you are pursuing. A combination of product experience, technical job experience and certification will ensure broader career opportunities for you. Choose your preferred path and review the certification requirements for the credential you would like to pursue. Certification requirements vary by path. Candidates should thoroughly examine and understand the requirements for their chosen certification path. 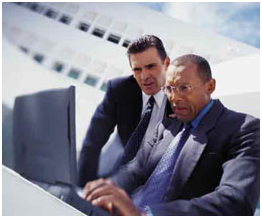 The associate credential is designed for IT professionals beginning to work with Oracle. Typically, OCAs will already have acquired the foundation of knowledge for their work as Web administrators, database administrators and developers. Oracle views the OCA credential as an appropriate starting point for techies early in their careers. "By earning an OCA certification, you can have increased entry-level job opportunities," says Oracle's OCA candidates guide. "It is the stepping-stone to starting a successful career as an Oracle professional." OCPs generally have achieved a degree of experience and success in their careers. For example, developers may have demonstrated their expertise by managing a large-scale Oracle database or developing applications used throughout a company. This credential is seen as a way to move on to senior-level positions. The OCM credential can be summed up in a single word: Guru. OCMs, whether database pros or developers, are crucial members of IT departments who handle mission-critical projects and tasks. The OCM certification credential "significantly raises the bar" for certification with its hands-on testing, according to an article in Oracle Magazine, a company publication. "The OCM is Oracle University's response to the industry's need to effectively test candidates on their ability to perform in a real-world, live application environment and is a test of both knowledge and experience," the article notes.